Altough here in the Pacific NW we enjoy the best salmon ever a fish lover like me needs a pink break from time to time. Chilean seabass is always the best option for me as its soft delicate but luscious texture reminds me so much my beloved hake, a kind of fish that is totally imposible to find here in Seattle. Don´t be! Cooking fish is easy and we are pretty good developing easy tasty simple recipes. This is one of them, pretty classic in our Atlantic NW, Galicia. In a pot place the peeled potatoes, the 5 peeled garlic cloves and the onion cut in big chunk pieces. Add the bay leaves, the black pepper and cover with water.Pour a tablespoon of salt and a drizzle of olive oil and let the potatoes cook at medium temperature until they are soft (between 20 and 30 minutes depending on the kind of potato). You can test them pinching with a knife. Add the seabass filet cut into square pieces and the minced fresh parsley or cilantro. Cook 10 minutes more. While the seabass is cooking prepare the paprika olive oil. Fry in a pan the whole garlic piece cut in a half without peeling it until is Golden Brown. Take out the garlic and wait until the oil is at warm temperature not too hot. Pour the tablespoon of paprika and stir until the oils gets a bold red color. To plate everything put 2 potatoes and piece of seabass on a plate. Drizzle everything with the paprika oil and add some pieces of the fried garlic too. I love pairing this dish with a rosé wine as it has a stronger flavor than a usual fish preparation. My yesterday choice was a classic one: Marqués de Cáceres DO Rioja. Enjoy! 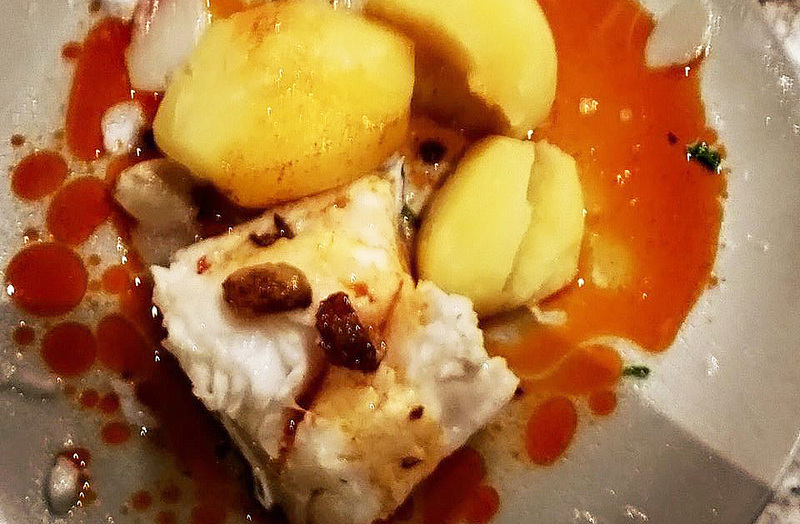 Posted on November 7, 2015, in Recipes and tagged chilean seabass, Galicia, Marqués de Cáceres, paprika, rosé. Bookmark the permalink. Leave a comment.